The Newfoundland and Labrador English School Board engaged in a multi-year planning process for the Grand Falls-Windsor school system that included consultations with the school communities. A memo was provided to parents/guardians in April 2016 providing an update on the implementation of the motion passed by the Board of Trustee. The motion can be found below and the memo is available here. Subsequent to the Board motion of 2015, District staff have undertaken significant work to assess student enrollment numbers for grades 4-6 and conducted extensive reviews of available space at Sprucewood Academy. Based on current projections the building can accommodate students for next year, and into the future. We have also received some feedback from school councils and parents/guardians with the preference to minimize, if possible, the number of changes students and families would experience during the process. Given this information, the Board feels it is appropriate to close Millcrest Academy at the end of the current school year. 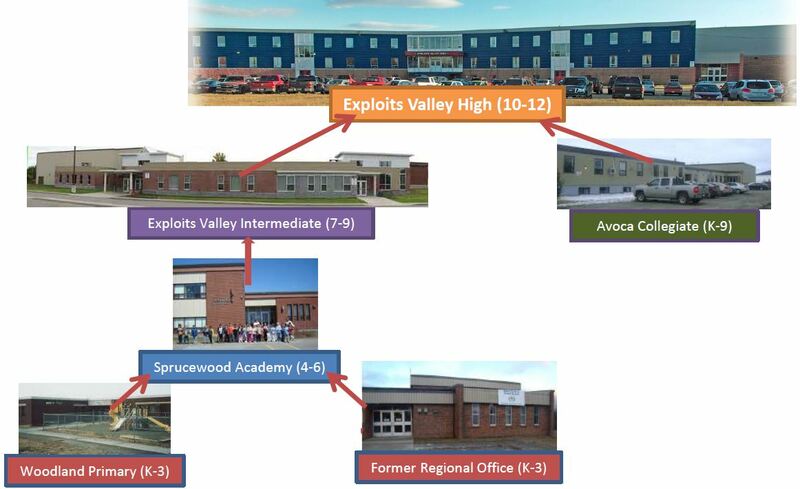 The new school catchment areas will be implemented such that all grade 4-6 English and French Immersion students will attend Sprucewood Academy in September 2016. The new catchment area is shown below. Click on the X to close the disclaimer if one is showing to see the map. On June 23, 2009, the former Nova Central School Board passed a motion to make Woodland Primary a K-3 school and make Sprucewood Academy a Grades 4-6 school. The motion also included extensions/renovations to both schools and the closure of Millcrest Academy. The Newfoundland and Labrador English School District proposed an amended motion which included an addition to the previous board motion. The Newfoundland and Labrador English School Board proposed the addition of a new K-3 school in the former regional office located on Price's Avenue and implementation of new catchment areas for that school and Woodland Primary. This motion was approved by the Board of Trustees.